First post here, but long time lurker, have gleaned plenty of useful information already - thanks. The space above the stairs is around 1200mm x 800mm but with some overhang on the sides away from the wall I can get a 1500mm x 1000mm (ish) baseboard on there. It's by no means ideal but until I build a shed I it's realistically all the space I can hope for. I've realised that an end-to-end layout offers much more potential for such a small layout. The space I have though means I'm going to have to have a U-shaped layout. What I'm proposing is a GWR branch line terminus. (Cliched I know, but I'm a GWR fan and don't have space for anything else right now and N gauge doesn't appeal to me.) . I'm envisaging a home counties GWR branch, the track layout is a bit of a mixture of Wallingford and Marlow; like Wallingford engine shed opposite plaform (I like the view down the layout into it) but with CWS creamery put where the gasworks was (to fill the scenic space in the centre of U) but with layout of runaround loop and position of goods shed like Marlow. As drawn, it uses the mixture of track I already have from temporary layouts I've had to date, both Peco Streamline and Setrack with a couple of Hornby curved points thrown in. To get it to fit I've had to resort to R1 curves but having laid the layout out in rough, the stock seems to run ok on it. The intention with the fiddleyward is to build a cassette or hinged section to attach to the stub in the top left. Stock will standard GWR branchline stuff - Airfix/Dapol14xx & Airfix autocoach, Bachmann pannier and Hornby B-set, Collett Goods and a Dapol Dean Goods (if only it went as well as it looked!). I also have a small Prairie, a Grange and a 43xx but they don't fit the prototype - lesson: plan layout, be realistic on what you can do in space, get stock later. If following the prototype I think it would almost exclusively be the 14xx autotrain including mixed trains but for interest I will mix this up a bit but hopefully within the realms of plausibilty, have through coaches/through workings or excursion trains (giving an excuse for the larger tender engines perhaps) - I think they had this at Marlow to some extent. (I have the Paul Karau books on these branches and the branch line terminals book.) At the moment, due to the livery the stock is in, post war GWR is favoured. The buildings will be card, Scalescenes kits or kitbashed or reworked Hornby stuff from my childhood. I've started on these and they are in dark red brick - one of the reasons why I am not looking at a west country layout as they would be stone buildings I think. I intend that the Creamery will be based on the CWS creamery which is relatively compact. Anyway, that's enough for now - thanks for your interest. I think you've done very well to fit an effective track layout in a confined space. It looks very GWR to me. Having a creamery and not wanting a West Country location, perhaps somewhere set in Shropshire or the Cheshire borders might be a district to consider. You are Paul Lunn AICMFP. Seriously, it's great to see a minimum space, Setrack layout so closely based on adapted prototypes. I hope you have fun with it. Aahh! The old loop and three sidings each side trick. But what a nice little layout for endless fun it will be when it is more complete. My only concern would be having to reach the two storage lines at the back against the wall if anything fails. Go ahead and build it - everything will fall into place nicely from the plan and what a great use of usually dead space as well. AICMFP? Yes, it does look Paul Lunnish, bur none the worse for that. It looks a super little layout. I agree about reaching the FY, but it's only a metre across, and you can reach from the LH side as well. If that's the space available then that's the space you've got to use and I reckon you'll be able to get it up and running fairly quickly which is a really good motivator. An excellent terminus layout I reckon, especially considering the amount of space you haven't got available. My only qualms are the reach to the fiddle yard 9which has already been mentioned), a possible lack of operational interest arising from short train lengths (but that might suit you) and the 'interesting' way in which you are going to have to shunt the creamery siding. Nothing wrong with the small prairie on a little branch. With regards to the comments about not being able to reach derailed stock at the back, I would suggest that you get a little picker or kitchen tongs and put some foam on the grab bits to help you recover any fallen stock. I like the scenic area of your plan, but on a practical front, will you be able to reach the fiddleyard at all when there is a metre of scenery and a backscene to lean over? It might be worth mocking up the buildings etc with a few stock boxes to see if you can still re-rail an errant wagon or uncouple a loco at that distance. As a completely alternative idea, how about using the available space to store a more portable layout? It looks large enough to store a pair of standard 2ft by 4ft boards, which could be set up on trestles in a larger space when in operation to give you a full 8ft end to end layout. Scenery would be much easier to build with access from both sides, and it would be simpler to wire with the bottom of the boards accessible. If space later becomes available in a shed it would be much easier to move the layout down there without having to scrap it and start again. I rather like this plan and although I would probably make it an 8ft end to end scenic layout without the curve on the end, and probably lengthen the platforms (I happen to have more space) I might well use part of the third board that would normally be for a fiddle yard to have something scenic along the front, with an embankment or something to the rear to hide the yard. Nice one. Always great to see something that's completely different to what you normally model (I'm more of a 1980's southern myself) and get inspiration to adapt it to something I can use. By the way, what is the size of your grid squares on there? My maths isn't working properly this morning and I can't figure it out. Must be the cold. Looks like it should be fun to operate - looking forward to seeing it develop. 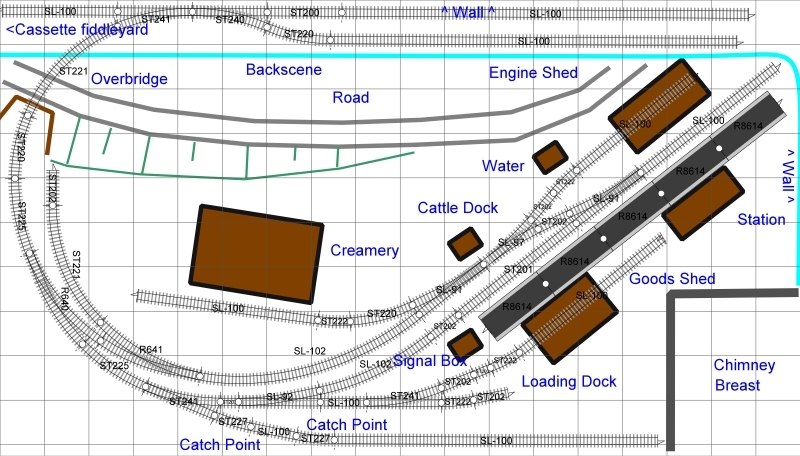 I take Stationmaster's point about shunting the creamery: would it be possible to swap it with the loco shed? Or would this change the character of the station too much? Personally, I think a largish structure with a tall chimney might work better there than smack in the middle of the board. I reckon it would be worth investing in a metre of flexitrack to make the sidings at the bottom of the plan flow a little better. And I'd probably make the dock siding a shade longer as it does look awfully short as drawn. Finally, there seems to be a bit of a squeeze in the track spacing of the loop, again right at the bottom of the plan, which may not be a good thing given the curves involved. My solution is as below: remove the straight at X and add a couple of sections as shown in red. As far as I can tell from a cut-and-paste analysis, this preserves the spacing quite nicely. I've also resited the trap ( ) point on the bottom siding to allow for the corresponding reduction in space outside the main line (and permit a more flowing entry to the siding). I might actually shorten this siding - it just looks too long to me and disturbs the balance of the plan. Edit: origin of "And I claim my five pounds". Yes that's something to think about - I jumped at Wallingford as that was in the Branch Line Terminals book. But different area might allow more variation in stock or better reason for it. I confess that I got the idea of the U shape layout from a branch line layout in the Setrack book! And thanks for the cultural lesson too. Perhaps at this stage - 1st layout with a fictional setting - I shouldn't be so picky on the stock. Tongs - great idea, have some long BBQ ones, will give it a go. Thank you. More responses to follow. Once again thanks. Glad you like it. Grid size is100mm by the way. Hi Paul, yes that is going to be a challenge. It's made harder that due to the location above the stairs the top of the base board is a bit higher, 123cm and that I'm a short ****. A step ladder might be needed and/or tongs as per another suggestion. As suggested, I'm mocking up the layout with rough buildings, track down temporarily to check things out. 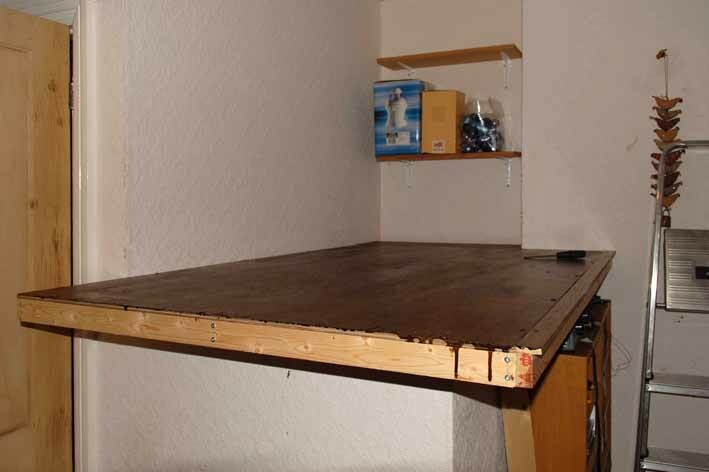 That is an interesting idea, however we just don't have the space to have such a layout out on the trestles - should have bought a bigger house/one with a garage! Further down the line a shed is the plan but I think a test layout to make sure I can build things/acquire the skills is the plan. Thanks Jules, I've been following Mayshill for a while and this has been giving me inspiration. Cattle dock - when it's in use it blocks the loop. Maybe at the end of the headshunt or in the yard? And could you put the two fiddle sidings on a slight incline with the low end to the left. This way if anything untoward happens there gravity will be on your side to get it out. Other people please connent on this as I haven't done it before like this and don't know whetehr it would work. It certainly wont work if you have locoless stock there as it'll just run out, but I sense that you're going to do your fiddling via cassette. Hello, it's been a little while. Thanks for the interest shown to date. I've had track laid down temporarily with the layout, run some trains and am happy with it. I'm now in the process of fixing the track properly. First go at doing this, so won't be perfect for sure but that's the point of this layout - a learning exercise. As suggested I've moved the cattle dock, this makes the yard less cramped and makes shunting more complex/fun. I've started to install some point motors am now thinking about signals. Here's an annotated plan. I'm not going to motorise all the points only the ones on the running lines that (if I've got it right) would be controlled by the box. The engine release point I'm motorising as if controlled by the box (as it's too far for me to reach) - I think this was not normal but not completely unprecedented? If that one was controlled by the box, should the one to the shed be as well. I'm pretending that it was spung to the loop and had to be held to the shed road, is that realistic? Am I right to link the points as shown, can I have them sharing levers? Is having the home signal split correct for this layout or would it be a single arm signal? Model is post WW2 GWR. Any guidance on the above or anything else I've missed with regard to signalling would be appreciated so I can make sure I get the right signals etc. Yes the layout is small, but I'm trying to get things as proper as I can, for practise. I'll be along later in detail but you need a few changes (none are too serious) but one thing you need to get in hand straight away is the release point to the run-round and the connection into the engine shed which would be worked as a crossover in real life. In the meanwhile also think about your Home Signal coming in - at present you have fewer arms than potential routes from the signal meaning some routes are not signalled when they should be - several possible WR prototype answers so have a think how you would like to do it and then we'll see if it's realistic. those comments apart it's otherwise pretty good and you're clearly going in the right direction. Point noted H for the shed would be normally set for the shed route to prevent stock running onto the platform line. Ground signal to for the platform release is likely not to be required as this point is more likely to have been operated by the loco crew via a ground frame (but released by the signal box). Crikey, thanks for the quick attention! Ground signal to for the platform release is likely not to be required as this point is more likely to have been operated by the loco crew via a ground frame (but released by the signal box). The layout a mixture of Marlow and Wallingford. The latter was One Engine In Steam (does that make a difference to this issue.) So let's say it's more akin to Marlow - which is where I got the split signal idea from, except there the is only one entrance to the yard. Could the right (small) arm refer to both yard entrances? The above is a bit busier than the prototypes used for inspiration, but after a while one gets bored with just the 14xx and the autocoach! So it's possible that at times there could be more than one train e.g. goods train in proces of being shunted in the loop, autotrain working on plaform line. Hope that gives some ideas as to how to do the home signal? Once again thatnks for the help and I look forward to any more advice. Thats the one Jon. I suspect that this would also release the point that I talked about as well. I'd be more inclined to go with a 4500 or 4575 to go with the B set. Hello. I've just come across your smashing little plan - more G.W.R., brilliant! May I make a few of comments? The first would be the seeming total absence of any provisions for coal on the plan, either loco. coal (and coaling facilities), or commercial (domestic/industrial) coal; small coal yards are not corny, they were a fact of life. The second would be the absence of a yard crane; again, these were quite common in busy little yards. You may say that there is one inside the large goods shed, but would that be adequate? My third point concerns the layout. You have a 'signature' industry in the creamery, and these could be quite large affairs with road access for tanker lorries, etc., and in its current, central location, it may dominate the visual composition without providing any useful scene blocking. Now you have an inconvenient chimney breast which, if suitably clad with factory, warehouse or, yes, creamery facings, could make a very convenient home for a signature industry. In this case, road access would be 'off stage' round the side of the chimney (as for the goods shed), and the siding running up to the front of the chimney breast (at the bottom of the plan) could then serve that industry with covered loading facilities running out from the front elevation of the building, blending the chimney breast into the layout. This would also provide a charming (?) view through this covered bay across the station, between the signal box and goods shed. The central siding now vacated by the creamery would now serve a small coal yard with a yard crane. Nice. Hope you don't mind the suggestions. I look forward to seeing progress. Thanks for the compliment and the suggestions are welcome. 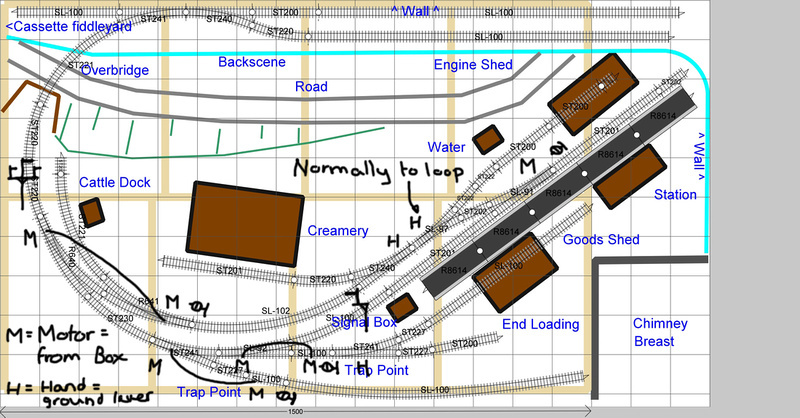 Coal yard - the plan didn't show this but that's what I intend the back siding in the goods yard for. Not that large but enough for a few wagons. Yard crane - good spot, I realised that after plan was drawn. I've a kit (Mike's Models one) to assemble for one. Not sure where to put it on the plan, probably between the end loading spur and the back siding. The blasted chimney breast - sounds like a good idea, one to try out. Certainly a factory of some sort to hide the ugly corner.